It has come to the attention of the editors of this fine weekly that Mr. John W. Cook, originally from Laporte county, Indiana, has recently established the Rocky Mountain Detective Association in Denver City. 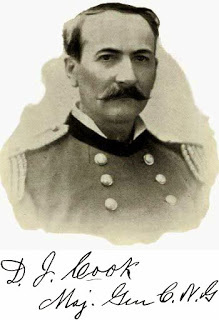 Along with his private duties, Detective Cook has enlisted in the Colorado cavalry and has been detailed the quartermaster of the Denver post as government detective. Our editor interviewed Detective Cook after his last case and asked how he happened to follow this unusual business. His answer: “It is natural. I can’t help it; I like it.” He states that numerous times he’s been placed in positions where a less shrewd, less courageous man would have been shot dead, or eternally disgraced. He is both brave and discreet, and possesses the essential qualities of mind and body to be a successful detective. Each of these qualities will be shown true as we share his first case. Detective Cook and his brother came to the Colorado Territory in 1859 with the intent of seeking their fortunes in the gold mining industry. They operated a placer diggings in Missouri Flat, between Black Hawk and Russell Gulch, and had accumulated $25o in gold-dust when one morning it disappeared. Now Detective Cook remembered a man, against whom no one had suspicions, but who had recently left town. Cook followed this man, overtaking him near Golden, and obtaining a confession and the return of his gold-dust. As all know, the law of the miners is death for stealing only $5 worth of any article from a miner. But Cook, being a kind and humane man, permitted the fellow to go free after the fellow reimbursed him for all expenses he’d encountered during the pursuit of the villain. I’m sure Denver Citizens, along with our staff, look forward to many more adventures of our new Detective Cook. Hands Up; or, Thirty-five years of Detective Life in the Mountains and Plains, Reminisces by General D. J. Cook, Chief of the Rocky Mountain Detective Association, Denver, The W.F. Robinson Printing Co., 1897. This entry was posted in 1864 and tagged Denver City, Detective, Frontier, John W. Cook, Murder, Rocky Mountain Detective Agency. Bookmark the permalink.